6 pieces Framed together ink on paper. Terry and the Pirates was an extraordinary adventure series started by Milton Caniff in 1934, and one of the most memorable newspaper comic strips of all time. The series was set in the exotic China, where a young Terry Lee and his friend Pat Ryan would face mysterious, dangerous, and sometimes beautiful pirate foes. The most well known and memorable of all foes was The Dragon Lady -- the fearsome femme fatale of the China Seas. Terry and the Pirates was full of lovingly crafted, vivacious characters and humorous stories that would influence comic artists and readers for years to come. The series ran for 12 years, and was a beloved favorite of both Greg and Tim Hildebrandt, and the fantastic Michael Uslan who is best known for producing the Batman films. Mr. Uslan's love of the strips inspired him to relaunch the title for a new generation, and in 1995, Terry and the Pirates was brought back to newspapers once more. With Michael Uslan as the writer and the Brothers Hildebrandt as the artists, Terry and the Pirates was retold in a way that retained its key elements, but changed others to create a modern new adventure for it's unforgettable cast of characters. 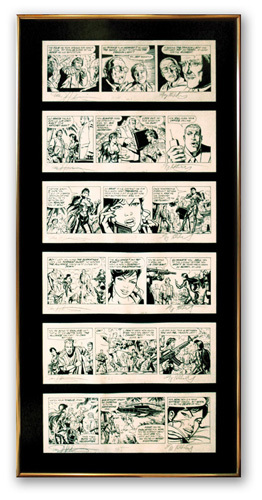 The Terry and the Pirates work on our gallery features the first 52 weeks of beautifully drawn, hand lettered strips illustrated by Greg and Tim Hildebrandt and lettered by the brilliant Kenny Lopez. Some strips also included inks by the talented artist, David Boller. Spiderwebart Gallery is honored to be presenting these unique pieces, and kindly reminds its buyers that these artworks have been unaltered from their original state. Tim Hildebrandt passed away in June of 2006. Each piece of this artwork was signed by Greg and Tim prior to Tims death.